When I think of the grunge style the first things which come to my mind are Kurt Cobain, the 90s and dark colors. Grunge used to be kind of a “dirty look” – no wonder, because grunge in English is another word for dirt – but today the status of this fashion direction has clearly lifted. Since the 90s made a comeback a few years ago, the grunge style has returned too. I identify strongly with this fashion direction and thought that I therefore dedicated a blog post to it. In general, I would not say that I’m just running around athletic or just feminine. I’m a mix of everything, most likely from streetwear and grunge. 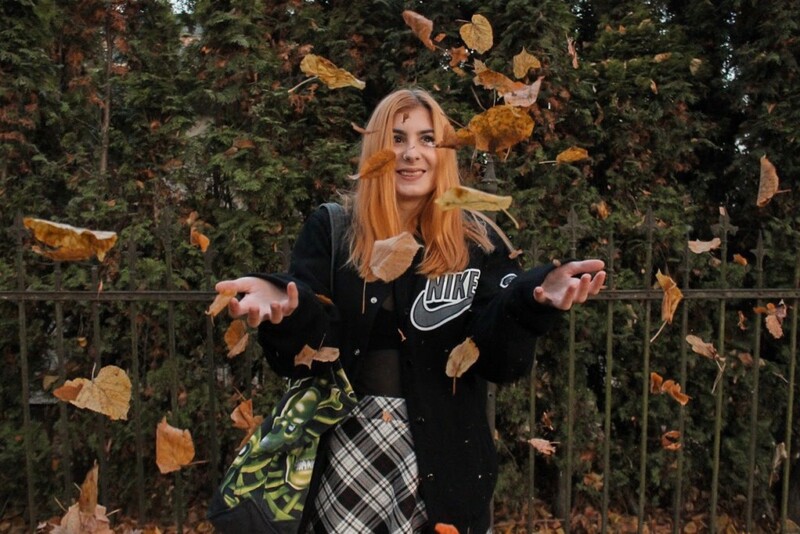 In this blog post I want to bring the grunge style closer to you and in another one streetwear. So, as the first outfit of this season I chose a typical Sarah look; a mix of streetwear and grunge style. It must also be said that these fashion directions can be mixed very well. By that I mean that this outfit for example fits in both fashion categories 100%. I buy most of my clothes, which are in this style, in second hand stores. From checked shirts to dungarees or jeans, you will find everything there. It sometimes takes a bit longer, but you’re even happier when you find something great. I like to stand out from the crowd, if I buy everything at Zara and Co. that would not work. Also, the quality of older clothes is often better than what you can buy today. I usually get inspiration for my looks from Tumblr, Pinterest or Instagram. One of my absolute favorite fashion bloggers is Lua. I’ve been following her for years, even before I had Instagram and just poked around blogs and stuff. If you want to style yourself in the direction of grunge and still need Inspo, I can only recommend her blog to you. When it comes to streetwear I do not have a direct “role model”, I just let myself inspired by pages like Hypebeast. Moreover, as I said, it is often the case that I mix these two styles. Of course, I sometimes run around quite more girly (for example here) but as I said, that is rather an exception and the streetwear / grunge mix is the norm. 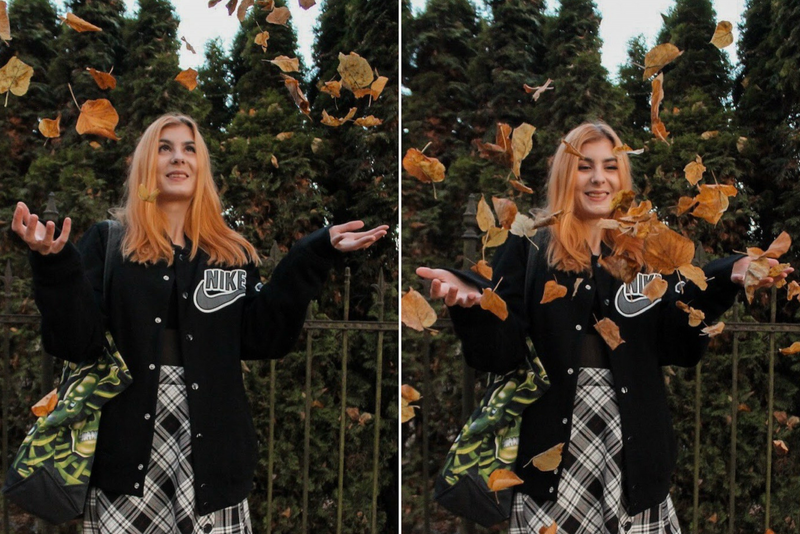 Okay, let’s talk abou the fall outfit (and some tips), which I want to show you. I wear this or simillar looks very often. Most of the time I am on the road with sneakers; just as in summer flip flops are a part of my life, some cool boots are a part of it when it’s fall. My favorites this season are some normal Dr. Martens in white. I would like to buy some black ones soon too, plateau boots would be cool (that was also IN in the 90s and comes back strongly this year) but that’s not Prio-1 at the moment. Boots, especially Dr. Martens, in my opinion belong to this style as much as plaid clothes. Therefore, I also took a black and white plaid skirt from Urban Outfitters. We arrived in mid-November and now the autumn finally also arrived in Berlin, so I picked also some dark transparent tights. The top is transparent and dark too, below that I just have a strapless athletic bra by Pepe Jeans. I think if the bra does not look too much like underwear, you can wear it well under such a garment. If it were summer I would have choosen a band shirt for this look. The college jacket is from Nike, which I got in the beginning of the year from a buddy. At the moment I wear it almost every day, as it is suitable to almost everything and offer the perfect warmth. Otherwise, vintage sports jackets from the 90s are popular when you talk about the grunge style. Personally, I own only one, you can see the jacket in this blog post for example. 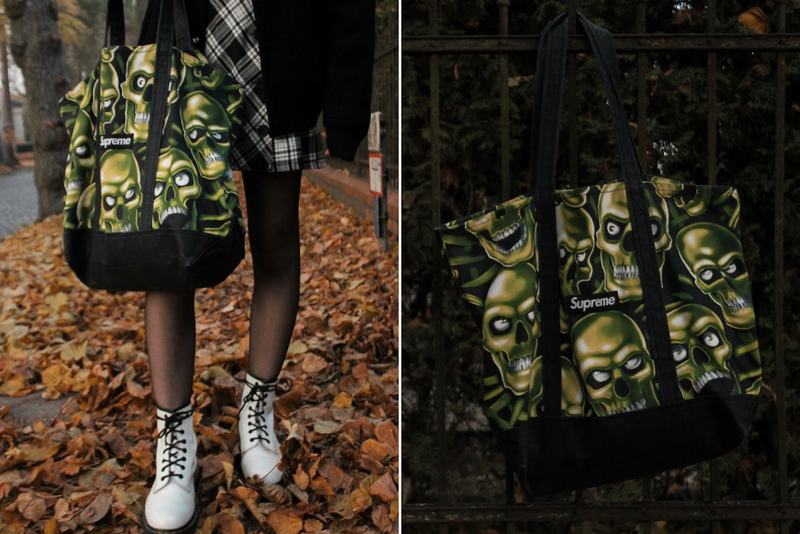 Also the bag of Supreme, which I wear here, is one of my favorites. Officially this belongs to my boyfriend but he almost never uses it and before it ends up as a dust catcher, I take it. When he got it, I found the bag really ugly but the longer I saw it standing in the corner, the more I liked it. There used to be such a situation when my boyfriend started wearing bucket hats, I always laughed at him when he was running around with his “fishing hat”. A few months later, I was not seen walking around without one. In 2014/15 bucket hats were a part of my signature look. Let’s return briefly to the accessories; I honestly do not know what exactly is typical for this style when it comes to bags but I think with a nice backpack or a totebag you can not go wrong. Otherwise thin sunglasses are really cool or some in the Kurt Cobain style. What I really like about this outfit is that you can wear it in any season – of course, slightly changed for each season. In summer, for example, you can take fishnet tights instead of the dark ones or without them at all. Also you can wear, as mentioned above, instead of something long a T-shirt. In winter, you can exchange the skirt with a cool mom jeans and combine it with a warm scarf. Only some sentence about the shooting place. The pictures on the street were taken just a few meters from our house. Actually, we wanted to go into the forest, but since the path was so beautiful full of foliage we decided to day there. The following photos were taken even more spontaneously. We met a buddy during the shoot and shot some more pictures in his garden. I hope I can go to the forest – before all the leaves are gone – to take some pretty autumn photos.